The biography of the teacher of the deaf who, through his knowledge of music and human speech and hearing, invented the Telephone. Alexander Graham Bell was a pioneer in many fields that aided communication over distances. He worked tirelessly to help the deaf communicate with others (even Helen Keller came to him for help). After the Telephone, Bell invented the Photophone (a device that uses a beam of light to transmit sound wirelessly), and developed phonographic sound recording methods. As a spin-off from his work with the Telephone, Bell invented the Metal Detector. A supporter of mans ""Pioneering Spirit"", Bell became one of the founders of the National Geographic Society. Bell felt that flight would be an effective way to bring people together. Forming the Aerial Experiment Association and working with a team of aviation pioneers such as Glenn H. Curtiss; Bell's Red Wing was able to make the first public demonstration of powered human flight in North America. Unlike the deadly Wright Flyer, the Red Wing could take-off under its own power without the need of a supplementary catapult, and could make turns safely. One of Bell's aviation inventions, the aileron, is used on all aircraft to this day. Bell also experimented with hydrofoils; culminating in the marine speed record setting HD-4. 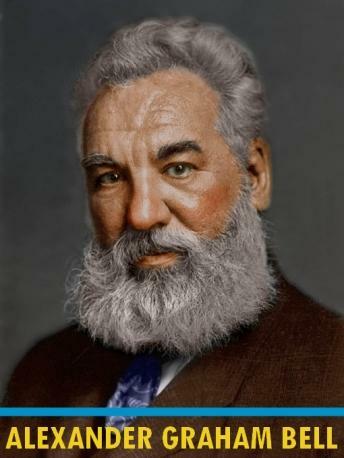 * Bell's Legacy to the World"
Alexander Graham Bell	The Bell Telephone Company of Canada	John Mulligan	$8.00	Biography	00:50	Autumn 2009	Unabridged	World	"The biography of the teacher of the deaf who, through his knowledge of music and human speech and hearing, invented the Telephone.